Nigerian motorists are tired of getting apprehended and punished by Vehicle Inspection Officers (VIO) and officials of the Federal Road Safety Commission, and they are doing something about it. A Twitter account, VIO/FRSC Sighting (@VioSightings), has just been opened to monitor and pass information on the location of VIO and FRSC officials. This is to help motorists evade them. The handle, which just came on stream about 48 hours ago, has raked nearly 1000 followers. Via a pinned tweet, the handle adds: “Hey guys! 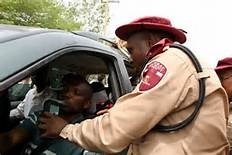 Please, when giving updates on the locations of VIO & FRSC officials, ensure you use a time stamp. Let’s not waste our efforts”.